​Left and Right Side Flames come in 3 pieces for easy layout. 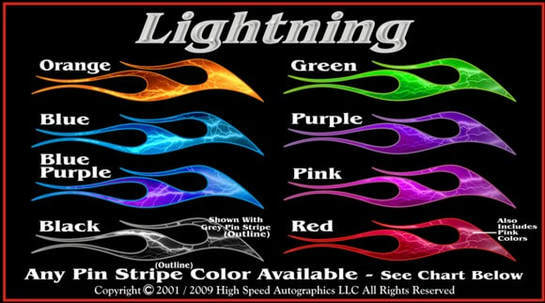 Top of tank graphics flow off the tank filler necks and also can be use on helmet. The "Just Tanks" version comes complete with left and right Side flames, Top of Tank flames, wet application recipe and a couple of "free vinyl goodies". The Diablo Flame design in the "Basic Kit" version has the same side tank graphics but doesn't have the "Top of Tank" flames. 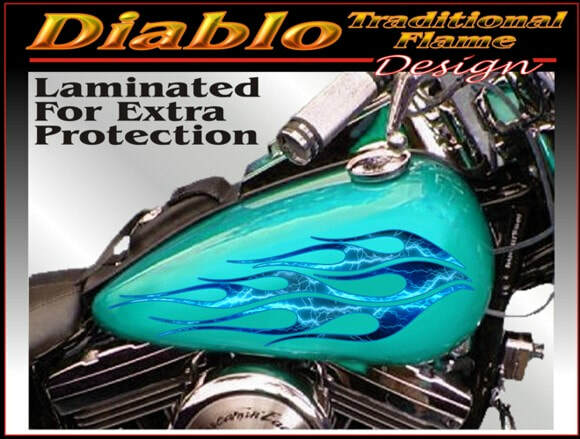 We do add front and rear fender, plus both side covers flames to the kit. 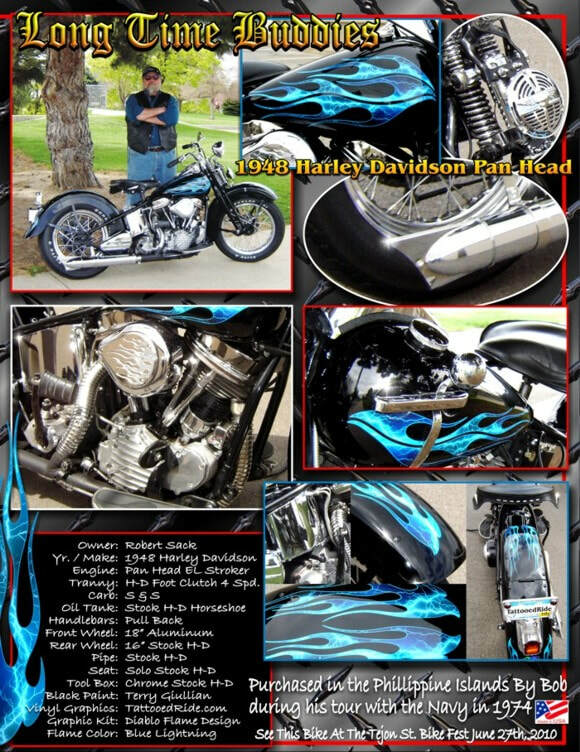 The "Full Dresser" version is the same as the basic kit but has extra flames for Faring and Side Bag areas. Our lift and lay wet application method with our wet application recipe makes the Diablo easy to apply. The clear vinyl laminate on the surface of the digital print making this a super durable and high gloss vinyl product. You can wax them and spill gas on them. We use top of the line 3M brand automotive grade vinyl products to create "print to order", computer cut and ready-to-apply graphic images. 10 Piece Kit $60.00 plus $6.95 shipping* WE SHIP WORLDWIDE! *Estimated Shipping Cost = $6.95 USPS inside the Continental US. Delivery time is 7 to 10 business days from time of your purchase. Other option is FedEx Ground / No Signature Required. See exact cost to your address in the shopping cart (page 3). We Ship Worldwide!